Many tourists come to Vietnam to enjoy the sun, but don't forget to eat some tropical fruits in Nha Trang. They are really great. Mangosteen is one of my favourite, but the first time I saw it, I thought they were nasty. They look like dirty stones, and only because of this fact I was afraid to check what kind of fruits they were. Don't judge a book by its cover! During my last day in Vietnam I bought just one mangosteen, but still I was afraid to eat it. Finally I decided to open it and check what was inside. And then, surprise!! Amazing small, colour and taste. A dark nasty "stone" has white, soft, delicious fruit inside. How unlucky for me, it was just going to the airport and couldn't buy more mangosteens. I regreted so much I didn't eat this fruit the first day whan I came to Vietnam. Have a look at the pictures of these amazing tropical fruits and make sure you try those fruits when you are in Nha Trang or other parts of Vietnam. The first name is in Vietnamese and the second is an English translation. It is good to learn Vietnamese names, it helps if you want to buy them. These amazing tropical fruits are white and very sweet. However, from the outside they look like dirty stones, so not very attractive. The best quality mangosteens are dark purple. It often takes 8-15 years for a tree to bear fruits. Mangosteens are one of the most tasty fruits I have ever eaten. Papaya fruits are large, weighing up to 9 kg. The skin is thin and turns from green to yellow and orange as the fruit ripens. The flesh of the papaya may be yellow, orange, or reddish orange. It is soft and quite sweet. Guava fruits are either round or pear-shaped, with thin dark green skin which becomes yellowish green as the fruits ripen. The fruits range from small tomato size to as large as 13 cm in length. The flesh is crunchy, similar to apples. Waterapples are bell-shaped and are about 5 cm in diameter. They are red or yellowish red. The center of the fruit is hollow and seeds are brown. They taste like normal apples, but they are not so sweet. Another amasing sweet tropical fruit. Sugar apples are usually green even when they are ripe. The edible pulp is a thin layer covering the individual seed. The fruits are very soft and sweet. They are very fragile and should not be kept for too long in the room. The soursop is a close relative to the custard apple, but it is much bigger. It can weight even 1.5 kg. The peel is smoother with tiny spikes. The soursop has less seeds than the sweetsop and the meat is more firm, almost chewy. In general, the fruit has a sweet and sour taste. In Vietnam, the soursop is blended with condensed milk and ice to make a delicious fruit drink. In Nha Trang and in other parts of Vietnam you will find great numbers of rambutans. When the season comes for rambutans you will see plenty of people carrying them in big baskets attached to bicycles. The rambutan, also known unofficially as hairy cherry, has its origin in the tropical low-lands of Malaysia. The name rambutan came from the Malay word 'rambut' for hair. The fruit is about 5 cm long and has soft fleshy hair from 2 to 3 cm long over the entire surface. The peel turns from green to yellow to red as the fruit ripens. The skin of this fruit is tough, thick and hairy. Its meat is transparent white and tender, and has a cool sweet taste. This tropical fruit can be found in many European countries as well as in Vietnam. The lichee is a close relative of the rambutan. The size is almost the same, but it does not have any hair. Instead it has tiny spikes and the peel is harder. The peel has pink or slightly brown colour and the meat is transparent white. Also sweet like the rambutan, but with slightly sour taste. The longan is a close relative to the litchi and the rambutan. The peel is brown and brittle. The meat is translucent white and is very juicy and sweet. In Vietnam, dried longans are cooked in water to make a dessert drink called “nước long nhãn”. When sliced cross-wise, the pieces of star fruit look like five distinct-angled stars. The fruit can be eaten raw or cooked. The sizes vary from 5cm to 17cm. They have yellow colour. They are oblong or pear shaped. They can grow to 90 cm long and can weigh up to 44 kg. Jackfruits have a thick pale green rind with thousands of sharp hexagonal spines. Once cut open, the interior yields dozens of individual golden yellow pulps. The meat of the pulp covers a large brown pit. When ripe, the meat is sweet. Bananas are not such tropical fruits for most of us, but babas that we know from Europe are so much differen than in Vietnam. Most bananas are small and very small. Some of them have just 3 cm and are so amazingly sweet. Also many kinds of bananas are green. They are certainly ripe. They will never get yellow. The banana plant can grow to height of 4 to 8 m, depending on the variety. Today, Vietnam boasts 28 different varieties of banana from plantains (used in cooking) to the dwarf banana (finger size). It is a variety of grapefruit. Pomelos have round fruits with yellow-green peel. The weight is about 1-1.5 kilograms. Each fruit has 14-16 segments. Its flesh is pink and contains a lot of juice. It is quite sweet. Dragon fruit, in some countries called cactus pitahaya, was one of the first tropical fruits I have seen in Vietnam. They have such amazing pink colour and few green parts that look like fish fins. They weigh from 200 to 500 grams. Dragons are avaliable all year round, but they are more expensive in October and April, since there are smaller quantities available. Dragon fruit skin can be yellow to pink or red. The thin rind encloses a large mass of sweetly flavored pulp and small black seeds. The flesh can be white, or dark pink. At room temperature, the fruit has a very short life. It becomes worse if the dragon fruit is alternately refrigerated and warmed. Persimmons are generally light yellow-orange to dark red-orange in color, and depending on the species, vary in size from 1.5 to 9 cm diameter. They have no seeds and they are quite sweet. This is another fruit not really considered to be a tropical fruit. In most countries in the world you can buy mandarins, but the taste will varry depending on the country of the origin. Vietnamese famous mandarins come from Ly Nhan. This is a name of a district located along the bank of the Red River. Ly Nhan has many kinds of sweet mandarins but the best kind is the Quyt Huong (Perfume Mandarin) which has a distinct aroma. Previously, it was usually dedicated to the king. The shape of Quyt Ly Nhan is flattish. Chiku is shaped like an egg and weighs from 10 to 200 grams. Its peel is brown with tiny cracks near the stalk. The pulp, which is brown and yellow, is very juicy and smells very sweet. When it is not ripe, it is not edible because it contains a lot of sticky resin. There are two popular species of chiku grown in Vietnam: orange pulp and white-yellow pulp chiku. The orange pulp chiku is planted in the north on the highlands. The pulp of the white-yellow chiku is light yellow or yellow and the peel is green or yellow. The peel is thin and the pulp is soft and has taste of peach, banana, and apple. This very stinky tropical fruit scares many tourists. Sầu riêng is translated as one's own sorrows. It is named after a sad story. Long ago, there was a young couple. Because of social prejudices that could not be overcome, the couple sought their own deaths in order to be faithful to each other. Their own sorrows received the population's sympathies, and the story of their tragedy has been handed down from generation to generation. To commemorate the couple, the locals have named one of their most valuable fruits sau rieng. Its skin is thick, rough, and covered with sharp thorns. With a gentle cut between the edges of the outer shell, you can easily open the fruit to expose the layers of bright yellow segments of meat that make the pulp look like it is covered with a thin layer of butter. 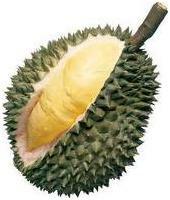 Durian is known for its incredibly strong smell. It is really difficult to remove this smell if you keep the fruit in your room and that's why many hotels do not allow guests to bring durian to the room. In Malaysia or Singapore it is also not allowed to travel with durian in the bus. There are no other tropical fruits lik this one. Maybe this is why durians are one of my favourite fuits. They have smooth peel that is either green or violet. Before eating a star apple, press your hands evenly around the fruit until it gets very soft. Then with a knife, cut it into two parts. With a spoon, grate the pulp until only the outer cover remains. This one is hard to call a tropical fruit, but Vietnamese watermelons are worth eating. They are so much better than in colder countries. Water melons in Vietnam are usually long. They are very sweet. The warm weather makes them so tasty. I guess there are many more tropical fruits in Vietnam. Should I add somethig here? Have you got any story to share about tropical fruits in Vietnam?